Want to stack this bold bagger motorcycle up against every other motorcycle in its category? Do it. For all-out riders, few motorcycles have this much power and feel as comfortable in the seat as the Victory Cross Country®. It's a rider favorite among the Victory Motorcycles lineup with performance, comfort and storage to get you where you want to go. Hang on and enjoy the ride. The 26.3 in. seat height is the lowest in its class. Riders with all inseam lengths will be able to plant both feet firmly on the ground. A lower seat height provides the rider with greater control of the bike and enhances a rider’s confidence at low speeds and when stopped. The fairing features an integrated audio system with KICKER® Premium speakers that deliver powerful, crystal-clear sound to enhance every ride. AM/FM/Weather radio is standard, along with an auxiliary cord to use your MP3 / iPod® as your music source. Victory Cross Country riders rule the streets with attitude and performance. 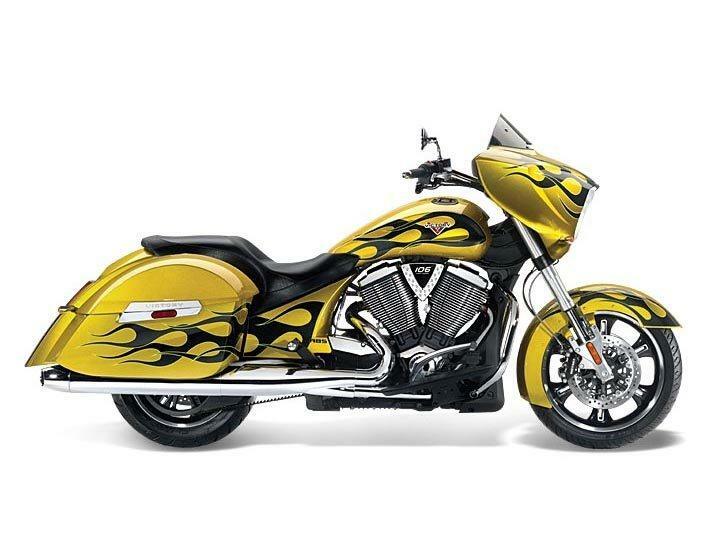 The 106-ci Victory® Freedom® V-Twin delivers 106 ft. lbs. of torque, and it’s a smooth, efficient engine – counter-balanced and fuel-injected. The 6th gear overdrive of the Victory 6-speed transmission drops the RPMs and delivers the smooth ride you’re looking for. The 5.8 gal. fuel tank gives you outstanding range to keep your Victory Cross Country on the streets, not at a gas pump. Rule the streets and enjoy long stretches on the open road between fill-ups.